The Hot Rhythm Club | What are the dances in Swing? This is perhaps the dance that MOST people immediately associate with Swing Dancing. You’ve seen it in such movies as Back to the Future, Swingers, and A League of Their Own. Typically, most swing dancers start off learning to 6-count East Coast Swing, because it’s a great introduction to basics of rock-steps, triple steps, and general lead/follow connection. The footwork is relatively simple (and hardly ever changes throughout the dance), which allows for new dancers to ease their way into dancing without a bunch of stress of remembering complicated steps/movements. Eventually, when dancers learn Lindy Hop, they can integrate East Coast Swing moves into their other dancing repertoire. East Coast Swing came out of the ballroom studios of Arthur Murray (in the 1940s) and is often associated with boogie woogie and rock & roll music, and can be danced comfortably to more uptempo swing music. The Charleston dance came about in the early 1920s, becoming popularized by the Broadway showRunnin’ Wild (1923). In the show, the song called “The Charleston”, was written by piano player James P. Johnson, and instantly became a smash hit for it’s unique rhythmic syncopations. Historians believe that the Charleston dance reached it’s peak of popularity in the mid-late 1920s. The Charleston, as a dance form, could be danced either with a partner (what we commonly refer to today as “20s Partner Charleston”) or as a solo dancer. Often times while dancing the Charleston, partners would break away from each other’s connection and do choreographed little solo combos. Lindy Hop is an 8-count partner dance, most commonly performed to jazz and big band music of the 1930s-1950s. Lindy Hop is a dance that formed from 20s Partner Charleston (see above), where the couple breaks out into an open position during the basic, most commonly referred to as “the swingout” (and what quickly became the basic step for Lindy Hop). You can see this transition in the famous clip “After Seben“. It is believed that Lindy Hop was born in Harlem around 1927. The dance was named in honor of Charles Lindbergh‘s “hop” across the Atlantic Ocean. Lindy Hop, as a dance form, is often known for it’s high energy and air steps (lifts, flips, dips, etc). The historical dance team most well known for these steps were called “Whitey’s Lindy Hoppers“, and you could often find the dancers of the team on the dance floor of the Savoy Ballroom in Harlem, dancing to the best swing big bands and musicians of the day. “Whitey’s Lindy Hoppers” had some of the most historically famous dancers on their team, including Frankie Manning,Norma Miller, Al Minns, Leon James, WillaMae Ricker, and Ann Johnson, just to name a few. While the dance group performed in a number of films during the 1930s and 1940s, the clip they are perhaps most famously well known for, is from the film Hellzapoppin‘ (1941). 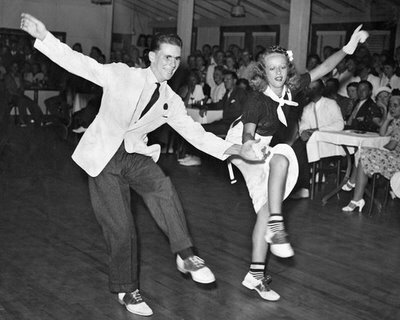 We could go on and on about all of the amazing clips and dancers of lindy hop (and its history), including present day dancing & dancers, but we’ll refer you to our awesome links page to help you learn more about swing dance history! The Balboa is a dance that was popularized in the 1930s, and is named after Balboa Peninsula in California, where the dance was invented. Due to an ever increasing crowded dance hall during the big band era, couples were literally squished together on the dance floor. Balboa, being a closed-embrace dance, was perfect for wanting to “cut a rug” in those tight dance spaces. Because the Balboa is a closed dance, with the lead and follow literally dancing chest-to-chest, the lead is really throughout the entire body, and the two dancers move as one on the floor, executing complicated footwork patterns below the waist. In Pure-Bal, the couple rarely breaks free of this position, and many intricately-led footwork patterns and styles can come out of the dance. In Bal-Swing, which developed later, the couple breaks free of this closed connection through the song, to perform turns, spins, mirrored swivels, and even tricks. Collegiate Shag is a partner dance that was made famous by the college kids (hence the name “collegiate”), during the 1920s and 1930s. This dance has a 6-count basic footwork pattern, and is known for it’s fun & energy! Primarily it was danced to more uptempo swing music. Shag was famous (and still is) across the entire United States, eventually spreading in popularity all over the globe by the end of the 1940s. There are many different variations and styles of shag dancing (St. Louis, Carolina, etc), but arguably, Collegiate Shag has always been the most popular among swing dancers.